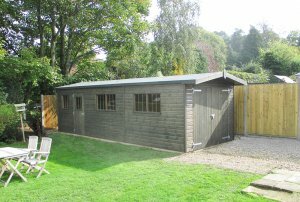 With our versatility in design, size and finish we can provide you with a Garage that will meet all your requirements. The robust construction will give you a long-term building for use as a workshop with a sturdy concrete floor, a place to store your vehicle(s) in, or for multiple uses with the help of a partition. To obtain a price for your own ideal Garage, click on the Create My Garage tab below. As we make each building to order we can produce non-standard sizes and designs whenever required. Please contact us on 01760 444229 with any queries. Decide how much space is available and then choose one of the designs that suits your requirements and that particular space. You can then decide if you want any extra doors, windows, or any other features on your garage. Choose timber double opening doors or up and over doors for your garaging requirements. You can choose to have electric up and over doors. To accommodate 2 double doors in your garage you will need to allow a minimum of a 5.4m frontage. You can also add a personal door to the side of the garage. Our timber doors are framed, ledged and braced, mortised and tenoned made in our workshops by our in-house joiners to ensure their quality. A double wooden door set are framed, ledged, braced, mortised and tenoned and all made in-house by our joiners. Additional single or double doors can be added to your garage for convenience. We make our own windows within our Joinery Works to ensure quality. They are glazed with 4mm toughened safety glass as a standard safety feature. All garages come with 6 windows and you can choose where to have them, it is possible to add windows or not to have any. We can make the windows opening and we offer Georgian effect or Velux® roof windows as alternative choices. Our windows measure 610 x 610mm (2’ x 2’). They are made from 75 x 50mm framing and finished with 4mm toughened safety glass. You may wish to increase the number of windows in your building for added light. Substitute any fixed window for an opening sash. Our opening sashes are top hung and are fitted with a brass casement stay. Make your windows Georgian for a more traditional look. Have your windows double glazed for added insulation and reduced condensation. Add one or more Velux windows to your building to gain extra natural light. It is only possible to have roof windows in apex style buildings with either Cedar Shingles or Slate Effect roof covering. We machine our shiplap into particularly thick boards. Our Joiners plane the shiplap giving a smooth surface finish, which looks great painted. Our weatherboard cladding is machined from the same high quality timber as the shiplap, but is left sawn which gives a more rustic look to your building. Due to the main uses of garages (storing your car inside, or using it as a workshop with heavy items inside), our Garages are set on to a concrete base and do not have floor boards to allow these heavy items to sit on a floor sturdy enough to support them. With our Timber Garages, we offer a wide range of roofing material options, so whether you want a simply designed garage, or something a bit more attractive, we can help. This is our standard roofing material: it is an extreme wear, heavy duty, 35kg green mineralised felt that is a non-rip material, and is applied with a propane torch to increase its longevity. We use only the finest quality Canadian Blue Label Cedar Shingles expertly tiled by our own skilled craftsmen. They give a traditional finish, and the original terracotta colour will 'silver' with age. They are expected to last 25-35 years. These individually laid synthetic slates bring nature and technology together to provide the ultimate protection against UV rays, wind, hail and fire. Opt for a more traditional grey, or choose terracotta for a different look. The terracotta goes well with the lighter shades in our paint ranges. 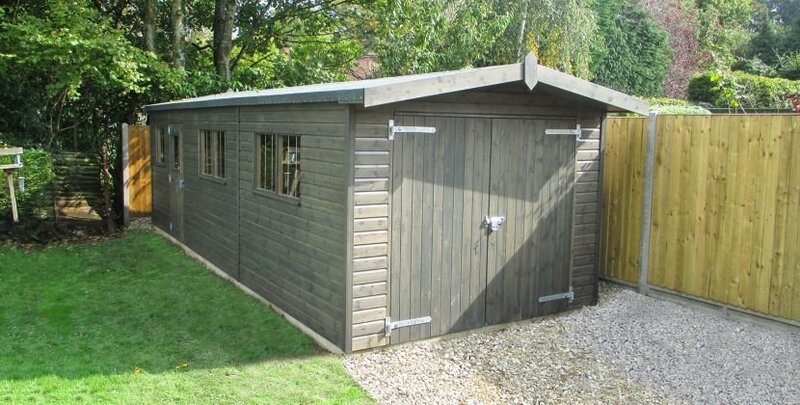 Our Timber Garages are exceptionally strong and robust. We have devised a unique Security Pack that will complement this structure and be of benefit if any items of value are to be stored inside. Since the introduction of our Security Pack in 1994 theft from our customers sheds has been virtually eradicated. We offer a 3 step Security Pack consisting of window bars mortised into the window frames, non-returnable screws are used on the hinges of the door, and we have worked with a lock manufacturer to produce our unique 7 lever security lock. Non-returnable security screws on the hinges of the door make it impossible to unscrew hinges. 13mm (1/2 inch) stainless steel bars are mortised into the window frame during manufacture. Our Garages come treated with light oak wood preservative as standard, which protects the timber from fungi and woodworm and gives the timber a natural looking sheen. We also offer three paint ranges to choose from: these are Valtti, Farrow & Ball and Sikkens, to give the best possible paint options for your building. High quality coloured wood stains. Allows the grain to be seen through the stain. In order for you to use your building all year-round, to increase your comfort and decrease any noise levels, we can line and insulate our Timber Garage, which also finishes the inside off in an attractive manner. If you choose to have the oak faced ply lining, insulation in the walls and ceiling will be included as well. Floor insulation can be chosen separately. The wall cavity is filled with 80mm thick insulation throughout, and the ceiling is insulated as well. We then fix the oak faced 12mm (1/2 inch) plywood internally. The oak facing gives a warm finish, and it is robust enough to handle any shelving, hooks etc. Battens are also used for an attractive finish. For that extra finishing touch, we fit skirting boards along the floor to achieve a polished look that our customers really appreciate. 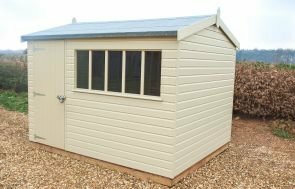 To finish off your Garage, both aesthetically and for practical purposes, you can choose any of these extra features for your building to suit your requirements. A roof overhang can provide additional protection to the facade of your building, as well as offer shade and rain coverage. The overhang can also give a more cabin-style design finish. Guttering collects the water run-off from the roof and then deposits the water away from the building. This stops the bottom boards rotting prematurely, adding longer to the life of your building. Our guttering is available in either black or white. Make your garage multi-functional by sectioning the space into separate rooms. Add your chosen size workbench to your building to aid your DIY or hobby needs. Our workbenches are 900mm tall, and 600mm deep, and for a solid, sturdy finish, we use oak-faced plywood. For lighting and using any equipment in your building, you may wish to consider our electric pack. Professionally fitted by qualified electricians who take all the wiring to a consumer unit ready for you to connect to your electricity supply. Internal wiring will be fitted behind any internal lining, and we can also supply your building with a heater, if you so wish. Side Walls - ex 19 x 125mm shiplap or 21>8 x 125mm weatherboard cladding on ex 38 x 75mm planed framing, all using high quality Northern Scandinavian Redwood. Doors - Double timber garage doors (1900mm high x 2134mm wide) that are mortise and tenoned, framed, ledged and braced. Each door is hung with the use of 2 x 450mm galvanised steel strap hinges and secured with a galvanised pad-bolt. If the up and over door options is chosen, a 1980mm high x 2134mm wide steel white door is used. Door Frames - ex 75 x 75mm planed. Windows - 610mm square set in a window frame that is fitted with 4mm toughened safety glass. All garages come with 6 windows as standard, but you can choose to have no windows at all if that is your preference. Roof - ex 19 x 125mm tongue and groove matchboarding, on ex 38 x 75mm planed framing, covered with green mineralised 35kg roofing felt. Trusses are used on all our garages. The heat-bonded felt is included in the price of our Garages as standard, although there are other roof coverings available (please see the Options tab for further details). Height - 2.0m to eave height or a more generous 2.1m to eaves. If you contact us directly, we can also reduce the pitch of the roof to keep the overall height to 2.5m to help you comply with planning permission regulations. Paint systems - Your building comes fully treated internally and externally with a light oak preservative, protecting against fungi and woodworm. There are also 3 different paint systems to choose from, for an increased redecoration cycle and a more attractive finish. For more information on these paint systems, please see the Options tab. 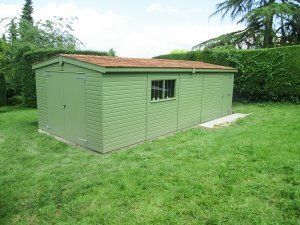 Our practical and functional FSC® certified timber garages are perfect for those wanting to utilise their extra outdoor space, or for those needing to store various items of machinery and equipment. 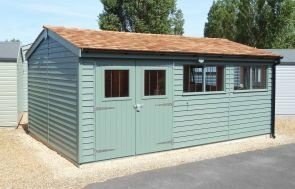 Designed and hand-built at our Norfolk factory, our Garages are also delivered and assembled at the specified delivery address by our in-house installations team. Selected from our range of FSC® certified Scandinavian Redwood timber, this large timber Garage was recently hand-made to order at our Norfolk factory before being both delivered and installed at the customer's address. 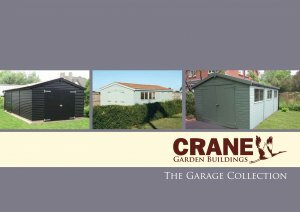 With 50 years of expertise in the Garden Buildings industry, Crane Garden Buildings offer a wide range of high-quality timber buildings for the great outdoors.